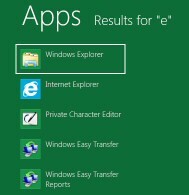 As you may know, Microsoft’s Windows 8 features a new User Interface. What you see after you sign in is a matrix of tiles, many displaying information which updates as you scan the display. The purpose of this page is to show you how to create a new tile for your Windows 8 Metro-style UI. Regard this exercise as preparaton for the main event of creating a new tile in the Windows 8 Metro UI. The easiest way to display a program’s tile is to right-click an app, then select ‘Pin to Start’ from the bottom right of the screen. From the new UI, press WinKey +q. 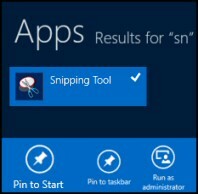 Type the first few letters of the App that you want to create a tile, for example, I typed ‘sn’ for Snipping Tool. When your app appears in the results, right-click; this should induce a white tick. Now you should be able to see the ‘Pin to Start’ icon at the very bottom right of the screen. Press WinKey, and return to the Metro UI; you should see a new tile at the very right of the Metro UI, I needed to scroll right in order to see my ‘Snipping Tool’. If I say to you: ‘this is not a easy task’, then it may explain why I divided the task into three stages. Furthermore, if you cannot make a Windows 8 tile from this outline, then you have my detailed notes below. The desktop is a good place to start, e.g SnippingTool. Right-click your shortcut – Pin to start. Plan B: [optional] Copy your shortcut to this specific folder. Plan B: Use the Metro Search to find your shortcut [Key point]. ‘Pin to Start’, just as you would an App. 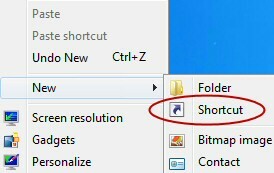 The desktop is a good place to create your shortcut. This won't work at the Metro UI. Right-click, select New –> Shortcut, type SnippingTool (all one word) in the dialog box. I named my shortcut ‘GuySnip’. My reasoning was so that I could find it more easily later. 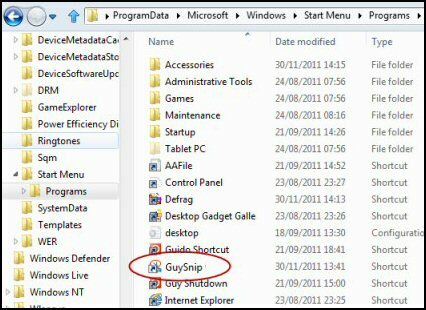 To give this exercise extra purpose, you could right-click the shortcut to SnippingGuy, select Properties, Advanced and tick ‘Run as administrator’. Return to the Metro UI and your new tile should be visible at the right of the screen. P.S. You can create shortcuts and then tiles for other Windows 8 programs, I just created one for gpedit.msc. 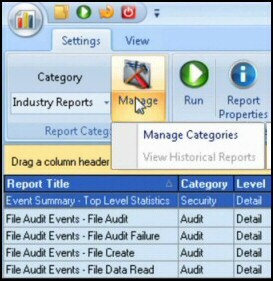 Right-click and paste into the folder, see screenshot below. Note 1: This folder is ProgramData not Program Files. Note 2: It’s not possible to create shortcuts here. Naturally, you need to change ‘Administrator’ to the name of your user. Proceed as though your shortcut is an App that you want to Pin to the UI. Therefore, from the Metro interface type:- ‘Snip’. Search Apps should appear and display your shortcut. To return to the Metro UI press the WinKey, your new tile will be at the extreme right, so scroll until you see your usual logon icon at the top. Underneath should be the new Windows 8 Tile that you just created. The performance monitor also contains the resorce monitor. Here is a quick way of creating a tile for this utility. Step 2: Pin to Start. 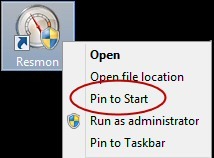 Just right-click the shortcut; select 'Pin to Start'. I did NOT need to Sign out / Sign in before my tile arrived. Sorry to harp on, but you did paste the shortcut to the correct folder? Note: ProgramData is a hidden folder. So in Windows Explorer click on ‘View’ and tick ‘Hidden Items’. 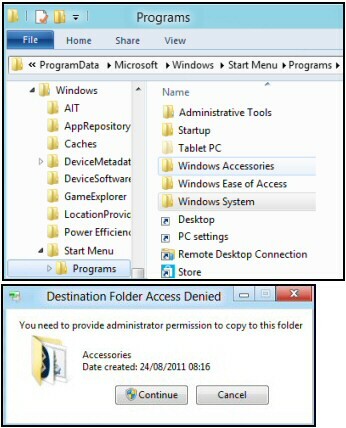 Actually, you can copy the shortcut to the Windows Accessories sub-folder. Sometimes I get stuck because the ‘Destination Folder’ dialog box in the screenshot right is hidden behind other Windows. Find it and click, ‘Continue’. If you already have a tile / executable with same name, I found that you could not create the second tile. For example if you have a short cut called ‘Guy Cmd’, then you cannot make another one called ‘Jo Cmd’. See how to create a Windows 8 Shutdown tile. Windows 8 IE 10 has two versions. 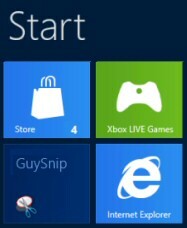 When you click on the IE tile on the start screen you get the Metro Version. See how to configure the traditional version of Internet Explorer v 10. If you right-click an App you can ‘Pin’, or ‘Unpin’ it to the Metro UI. It’s not long before you start dragging the Tiles around, grouping them and moving the most important to the left. Break-down the task into stages. Create a shortcut corresponding to your tile. Right-click the shortcut and 'Pin to Start'. Alternatively, copy the shortcut to the specific folder: C:\ProgramData\Microsoft\Windows\Start Menu\Programs. The final stage of this technique is to search for the Apps and then Pin its tile to the Metro UI start menu.